Designed from the outset as an external product, residential timber doors should have deep sashes to provide room for modern locking systems and drainage channels. 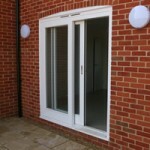 Fitted with insulating glass sealed units or solid wooden panels they can be installed with matching sidelights or fanlights to meet your individual requirements. Timber in-line sliding patio doors should feature high performance rail and tracking systems to ensure smooth running and easy operation. 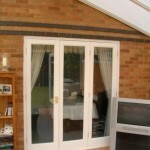 Sliding patio doors are ideal in situations where both internal and external space is at a premium and where hinged doors would create an obstruction. 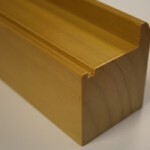 Normally used as an engineered laminate stock, European Redwood provides a cost effective solution for timber doors, windows and conservatories. 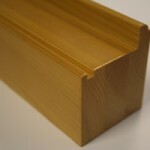 European Redwood is laminated (where more than one length of the timber is glued together with the grain of each length at 90º to the next one) in order to improve durability and stability of timber doors. Sapele is a class three to four moderately durable hardwood from West Africa featuring an attractive reddish brown grain which is enhanced by a stained finish. 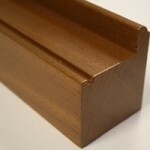 It is one of the most popular species to be used for timber doors, windows and conservatories due to its availability and relatively reasonable cost. Accoya® is the world’s leading high technology, long life wood and consists of a pine species which is generally modified by the acetylation process to provide a class one durable timber, at least as strong, durable and stable as most tropical species. The acetylation process creates a non-toxic but permanent change in the chemical composition of the timber to make it resistant to biological attack and weathering, as a result it also provides more dimensional stability. To achieve this, acetylation causes a reduction in hygroscopicity of the timber – in other words it less likely to be affected by water and water vapour. 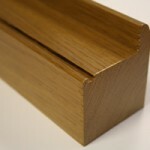 European Oak is a durable class two timber with an attractive grain and should not be confused with American White Oak which is suitable only for internal joinery products. It is one of the most expensive species to be used for timber doors, windows and conservatories but will result in an excellent and long lasting product. 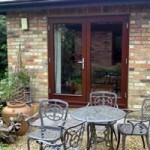 The very best manufacturers’ paint or wood stain finishes for timber doors are of a very high standard, with each product typically undergoing a four step process. This includes protection of the end grains, a primer coat applied by flow-coater and two top coats applied by a controlled spray line. 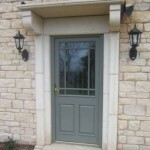 The following translucent colours are available on timber doors, timber windows and timber conservatories, but you should request to see a colour board prior to making your decision, to confirm your choice.